Eu definitivamente odiei a nova mecânica dos porta-aviões. O desempenho em jogo dos porta-aviões na equipe vem sofrendo em todas as partidas que participei até o momento. Sinceramente, gostei mais da velha mecânica. O desempenho do navio foi melhor. Estou começando a pensar que os porta-aviões não são mais necessários no jogo. Participating in this conversation, I would just like to express my disappointment about the removal of the odd CVs of both the American tree and the Japanese tree. I usually play with the Japanese CVs, although I consider myself a mediocre player, I like the fun that the CVs provide, to be able to have historical ships in my port. Therefore, I resent the Japanese aircraft carrier trees losing the Zuiho (1940), the famous Hiryu, sunk in the Battle of Midway (1942) and the muscular Taiho, sunk in 1944, in the Battle of the Philippine Sea. It's unfortunate. What's up guys! Does anyone have news about the future Pan-American technological tree? Any outlook for 2019, or will it all depend on the pan-European tree coming out first? I would like to see these premium ships: 1. Regele Ferdinand-class destroyer (1930, Romania); 2. NMS Mărăști or NMS Mărășești (Vifor-class destroyer, 1920, Romania); 3. España (España-class battleship, 1913, Spain); 4. Reina Victoria Eugenia-class battleship (1914/1915, Spain). 5. Ning Hai, Ning Hai-class Light Cruiser (1932, China). Again a very good video. I was very happy to see the research credits made by @Talleyrand, and the quotation from @mobryan and @BrunoSchezer. That was really cool! In this last video there is much of the result of the conversations in the topic of the previous video. I found it very complete and comprehensive. Congratulations! ps. Will the captains of the Pan American tree have Hispanic or Portuguese names? Hahahaha ... !!! There will be weird Brazilian captains with Hispanic names. You have a very good material here. Congratulations! None of the projects you mentioned could serve to fill the niches of Tier 9 and Tier 10? Have these projects already had previous names or not? If this is true, what does WG intend with Austro-Hungarian ships? Wow! I did not even realize that I quoted with the translated text. LOL !!! I am also willing to wait, but I confess that I am already suspicious that we will not see the GZ for sale any more. Honestly, this delay in relaunching the GZ is already causing a lot of anxiety in the players and the suspicion that it, perhaps, disappears of the game. Honestly I think WG should give some satisfaction to the players about this CV. "Brazil expects each one to fulfill his duty!" "Hold up the fire, that victory is ours!" I found it very cool! I will read.¡Muchas gracias! Is it possible for WG to invent a nonexistent ship to fill a T4 gap in a hypothetical Pan-Am cruiser tree? This is for the @Talleyrand. I noticed that you used indicated the Light Cruiser Bahia-Class for the T2. I wondered if it would not be more appropriate for a T2 to be represented by a Protected Cruiser: Almirante Tamandaré (1893), Almirante Barroso (1897) or República (1894)? I think it's more suitable for a T2, or am I mistaken? Indeed, in a quick search on the internet, it is almost impossible to find meaningful naval warfare that matches the 1920s in all Latin American navies. 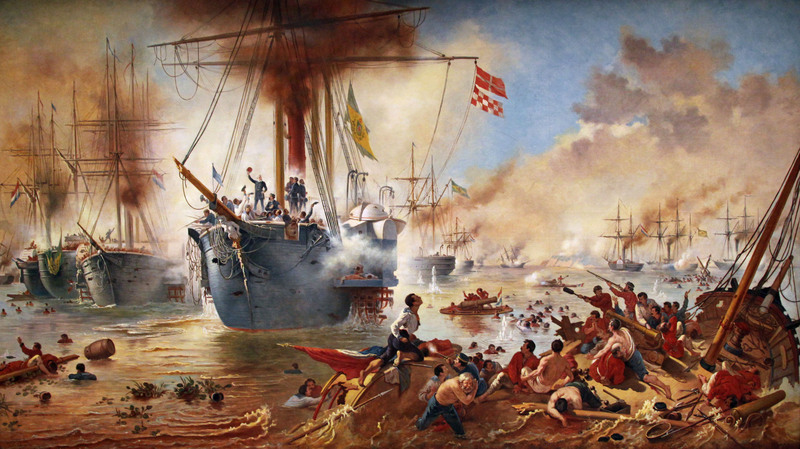 Unfortunately we can not oppose the navies of other countries of the South and Central Americas, since many of them would be linked to the navies of France, the United Kingdom and the Netherlands. One curiosity about the Acre-Class destroyers is that they are also known as Amazon-Class ships. Originally these ships were the Amazonas-Class, numbered from A1 to A6, being the destroyer Amazonas numbered A1. However, the ship's tack numbers were changed, following the alphabetical order of the names, so that the destroyer Acre was numbered D10, the destroyer Ajuricaba was numbered D11 and the Amazonas was numbered D12. As a result, the name of Amazonas-Class changed to Acre-Class. But the Brazilian Navy recognizes both names. I'm very excited about the Pan-American tree. I would very much like to see which ships WG will choose to represent Brazil. As for the video, about the aircraft carrier NAe São Paulo (A-12), I think it does not make much sense to be hypothetically quoted for the game. He served in the French Navy in the 1960s and Brazil bought it only in 2000. The aircraft carrier closest to the reality of the game would be the NAeL Minas Gerais (A-11) Colossus-Class that was launched on January 15 1945, by the Royal Navy as HMS Vengeance, which was later commissioned by the Royal Australian Navy in 1952 as HMAS Vengeance. Only in 1960, Vengeance was purchased by the Brazilian Navy and named Minas Gerais. The NAeL Minas Gerais generates some difficulties for the game: (1) Same name of the battleship Minas Geraes (name with the old spelling, 1908); (2) while an aircraft carrier of the Brazilian Navy, it is fifteen years after the World War II; and (3) by 1960, it had the modern characteristics of a post-war carrier. I would very much like to see the Battleship Rio de Janeiro in the game, but I find this very unlikely due to a possible British lobby. As for the Battleship Minas Geraes, I think it should be a tier 3. I was left with a doubt (excuse my ignorance on the subject), but what's the difficulty of finding a tier 4 cruiser? Is there a shortage of naval means that fill this niche? Do you know the Acre-class destroyers? They were built at the Arsenal de Marinha do Rio de Janeiro (Navy Arsenal of Rio de Janeiro), during the 1940s.